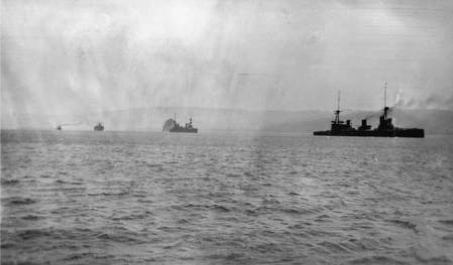 Australian fleet led by HMAS Australia enter Simpson Harbour, Rabaul. September 1914. The speaker at our next meeting on 3 June will be retired Lieutenant Colonel Peter Sweeney RFD with a presentation titled “Rabaul WWI & WWII”. Prior to the start of WW1, the region just to the North of Australia was held by Germany as a part of its South-Pacific protectorate known as Kaiser-Wilhelmsland. Further to the north the powerful German East Asiatic Squadron commanded by Vice-Admiral Maximillian von Spee threatened to base itself in the German port of Rabaul and threaten Australia’s links to the outside world using the powerful radio network Germany had established in the area. Hear about Australia’s first expeditionary force raised to meet this threat. In WWII, Imperial Japanese naval forces from Truk Island invaded the Australian territory around Rabaul in a strategically significant Pacific campaign that became a springboard to attack New Guinea and threaten Australia. Peter is a military historian and a battlefield guide. He is studying a Master’s degree in Military History at the ADFA campus of UNSW. He has guided in Gallipoli and Australian battlefields on the Western Front – Fromelles, Villers-Bretonneux, Poziers, Polygon Wood. Peter can direct members to internet military records sites should they wish to search for the service history of relatives.